Series 9000 Preformed Spray Scrubber - Bionomic Ind. 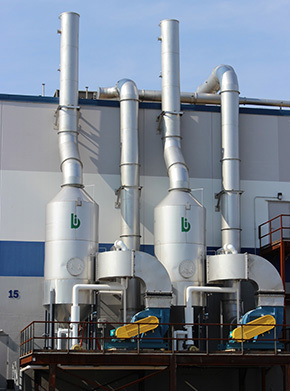 A major advancement in cyclonic scrubber technology, the Series 9000 Preformed Spray Scrubber is capable of outperforming venturi scrubbers on an energy cost basis for collection of particulate in the 2 micron and larger size range and simultaneous removal of gaseous pollutants. The Series 9000 Preformed Spray Scrubber incorporates a unique specially designed gas entrance involute section fitted with proprietary reverse jet sprays for concentrated and rapid treatment of dust particles and fumes. Access to and ability to service the spray components from the exterior of the scrubber eliminates the inherent maintenance problems and resultant downtime as with conventional spray scrubber devices while achieving a major increase in collection efficiency. The completely unobstructed open design of the scrubber vessel eliminates solids buildup and required cleaning, maintenance or replacement of internal packing elements, turning vanes or mist eliminator components. Furthermore, the Series 9000 Preformed Spray Scrubber is extremely compact enabling installation in limited height locations. Contaminated gas enters the long narrow involute (1) and is horizontally accelerated through a concentrated zone of sheared reverse jet spray (2). In this zone, the hydraulically atomized extremely fine droplets of scrubbing liquid at high relative velocity collide with the oncoming gas and impinge with the particulate. Any water soluble gaseous pollutants present are absorbed by the millions of created spray droplets. This combination of the unique involute and spray zone design generates a fierce scrubbing action that eliminates bypass and escape of untreated contaminants. The particulate contained liquid droplets agglomerate in the final section of the involute (3) and undergo an initial separation from the gas stream before entering the cyclonic entrainment removal section. Without the need for internal baffles, plates or vanes the high efficiency involute design creates a positive centrifugal action to remove the majority of droplets from the gas. 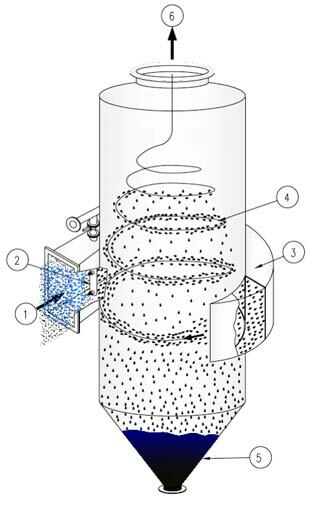 The gas then enters into the cyclonic separator section (4) where spinning forces the remaining entrained liquid droplets with pollutants to separate from the gas through impaction and collection on the scrubber interior wall, gravity draining into the sump section (5). The cleaned gas free of moisture droplets exits the top of the unit (6). For a more complete listing of the applications suited for the Series 9000 Preformed Spray Scrubber, please visit our Industries/Applications section. Please click here for pdf of the Bionomic Air Pollution Control, Product and Heat Recovery Systems Guide.